The 2009 Musicians On Call benefit auction includes a one-hour personal painting lesson for two with music legend Tony Bennett at his private studio in New York City. In addition to his extraordinary career in music, Tony Bennett has been painting all of his life and is an accomplished visual artist. He received formal training in art at the School of Industrial Arts (now known as the School of Art and Design) in Manhattan. Tony Bennett paints under his birth name Anthony Benedetto. His paintings have been exhibited in museums and galleries throughout the world. 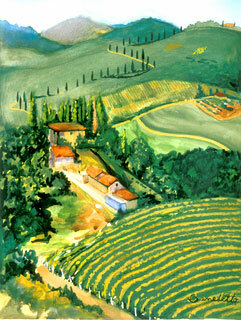 The auction also includes a signed giclee print of a Tuscan landscape by Tony Bennett. Other items up for auction include autographed guitars from Bruce Springsteen, Coldplay, Depeche Mode, Rascal Flatts, Kenny Loggins, Black Crowes, Kings of Leon, Kanye West, David Cook, & Brooks & Dunn. There are also celebrity experiences with Fall Out Boy, Ne-Yo, iCarly star Miranda Cosgrove, Jordan Sparks, and others. Visit the Charity Buzz website to see the complete auction listing. The auction closes Mar 5, 2009. Musicians on Call brings live and recorded music to the bedsides of patients in healthcare facilities. In addition to the auction, there will be a benefit concert with Grammy award winner James Taylor at the Hard Rock Cafe New York in Times Square on February 24, 2009. For more information, visit http://www.musiciansoncall.org/.